Posted by Argos. December 12th 2013. Over Christmas it is easy to get distracted due to all the business around us. However as they say an inch of prevention is worth a yard of a cure so here are some things to look out for this Christmas that can be hazardous to your dog or cat. Remember just because humans can eat it does not mean it’s not toxic to your pet! Like most pet owners dogs cannot resist chocolate. So don’t be fooled into thinking that wrapped chocolate is safe from your dog as experience shows that chocolates which are under wraps but accessible are eaten this includes; presents under the tree, tree decorations and even the ‘secret’ box of chocolates ‘hidden’ in the kitchen. Chocolate contains Theobromine which affects the nervous system and heart. Dark, ‘high cocoa’ content chocolate is far worse per gram, than normal milk chocolate. White chocolate is generally harmless. As little as 1-3 grams i.e. one square of 70% cocoa, dark chocolate, could be toxic or even fatal to a small dog or puppy. 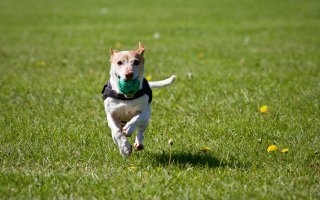 Signs of toxic levels of ingestion include shaking, hyperactivity, panting, diarrhoea and in the worst cases can progress to fits. We know these dried fruits go towards making a tasty Christmas pudding for us, however raisins and sultanas can poison dogs. So it is important to ensure your dog cannot access any Christmas puddings or cakes. Sadly these human treats can cause dogs to have kidney failure in some cases. So no pudding leftovers or treats off your plate, please. Grapes are equally as threatening and for some dogs a single grape can be fatal. Any food with bones in can be dangerous for pets and can cause an obstruction resulting in choking, an intestinal blockage or constipation. Many Christmas foods are very rich and fatty and on top of their normal diet often cause upset stomachs. 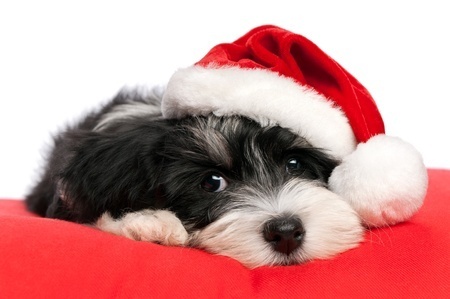 Not nice for you or for them, so think carefully before giving your pet different food over the Christmas period. Keep bins tightly closed or out of reach or even better put these bones straight into a secure outside bin. Fatty chicken/turkey skin or lamb can cause stomach upset and in some dogs pancreatitis which is a potentially life threatening abdominal condition. If you would like to treat your cat or dog to a festive lunch, white meat, either turkey or chicken, (with boiled or steamed vegetables for dogs) will be just perfect, but miss out on the high salt / high fat / high calorie, gravy though. Both of these ingredients can cause problems for your pets – they unbelievably can even be life threatening. It should be noted that most gravy’s contain onion powder so do not be tempted to give your pets any. Onions and garlic contain thiosulphate which can cause a severe anaemia (lack of red blood cells) which may take a few days to show. Signs of this condition include breathlessness, lethargy, diarrhoea and vomiting. Nuts are a popular snack at Christmas and a component of many sweet treats. The majority of nuts will cause no harm to your pet. However, in dogs Macadamia nuts can cause problems. As little as six nuts can result in weakness, depression, vomiting and hyperthermia for your pet, so keep clear! Many pet owners think it is ok to allow furry friends a drop of Christmas spirit, but even a small amount of alcohol is dangerous. It is important to take care when bringing festive plants into your home over Christmas. Poinsettia, Holly and Mistletoe are very toxic to cats and dogs and can cause vomiting and diarrhoea. Make sure they are well out of reach of pets and check regularly for fallen leaves and berries. Tinsel, baubles and coloured lights may appeal to more inquisitive pets, especially young animals. So ensure they are out of reach and that your pet has plenty of their own toys to entertain them. You could try rotating their toys so that they don’t get bored and you could smear a little bit of pet toothpaste on some of them to enhance their smell and taste. 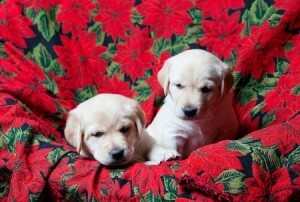 Supervise pets near Christmas trees at all times and take extra care to cover exposed wires. Many decorations can cause serious problems if swallowed. Cats enjoy chewing objects like pieces of string or elastic and tinsel provides an interesting sensation. However, if swallowed tinsel will cause life threatening intestinal blockages. Even in tiny doses antifreeze can be lethal to cats causing kidney failure that is very difficult to treat. Cats seem to be attracted to its taste and will even lick it from their paws if they have walked through it, so thoroughly and immediately clean up any spills from your vehicle. It is important to notice the signs of this poisoning which include vomiting, lethargy, increased urination and seizures. By being aware of these items that are hazardous to your pets you can prevent any problems, keep your pets safe and enjoy the festive season.